No sugar Keto fudge is the best chocolate cheat for a low carb or ketogenic diet! Best healthy fudge recipe ever! Diabetic friendly! When I started my ketogenic diet or keto lifestyle I knew there had to be a way to satisfy that sweet craving. I don’t crave sweets very often but sometimes I need that sweet snack! This no sugar keto fudge is so good, you will love it and you’ll never have to worry about those cravings for something sweet sabotaging your weight loss goals again! This no sugar fudge is diabetic friendly. So this is a great snack if you or some one you know is diabetic or sensitive to sugar. I think the best part about this is that you keep it in the freezer so it lasts a long time and when you want some you just break off a piece to eat. Some days I make a few trips to the freezer for a piece because it’s that good! I also make a double batch because it lasts so long in the freezer. It doesn’t get super hard in the freezer so I am able to easily break off a piece with a knife when I need a quick snack. I will also add that my kids love this as well, which is great because it’s not made with sugar. It is made with a product called Swerve, which is a combination of erythritol and oligosaccharides that looks, tastes and measures just like sugar. It’s great for baking and healthier then all those other sugar replacement on the market. I use it whenever I bake and don’t want to use sugar. It really does taste good in baked goods and is easy to use. You can buy it almost anywhere. 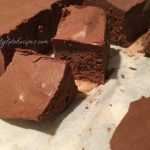 You will love this recipe and Keto fudge is a recipe that will go well with your ketogenic or low carb meal plan. I’m sure you’ll agree once you try it! I get so many requests for this recipe from people doing low carb (ketogenic) diet! 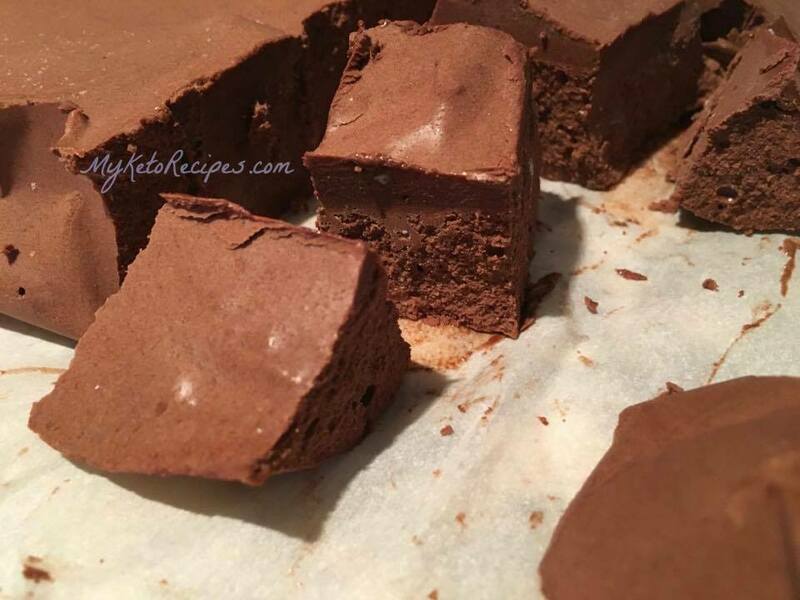 This is the best no sugar keto fudge recipe ever! Add all ingredients to mixer and mix until just combined. Scoop mixture into a parchment paper lined dish or into silicon molds. The size of the dish will affect the thickness of the fudge so use a smaller pan/container if you want thick chunks and larger pan for thin fudge. Top with sliced almonds, unsweetened shredded coconut, or whatever else you'd like. Freeze for 30-60 minutes (or until firm). Remove from freezer and cut fudge into squares of whatever size you'd like. Return to freezer until ready to eat. Just be diagnosed with a sensitivity to sugar. Thank you for this recipe. I’m no longer a diabetic, and do as many Of the keto recipes as possible. Happy cooking. Do you by chance have the macros for this? Maybe I missed it but I didn’t see them in the article or recipe. Thanks! Will you please tell me how much fiber is in this recipe? Thank you ðŸ˜ŠðŸ˜ŠðŸ˜Š. Can granulated Splenda be substituted? Yep! That’s what I use. I don’t really care for coconut oil. Is there something I I can use in its place? Do you use powdered swerve or granular?